CBD Oil for Dogs: Is It Worth the Money? CBD oil has been getting a lot of press lately. So you may be wondering: does it really deliver on its promise to reduce pet anxiety, restore arthritic joints, and even reverse the growth of cancer cells? Or, is CBD oil just another overblown fad? It’s normal to wonder whether these products are safe, worth the money, and beneficial for your pet. 1. When should your dog take CBD oil? There’s no reason to limit these health benefits to humans, though. Dogs might have more fur on the surface, but under their skin, they aren’t much different than us and they suffer from similar health problems. As your pet grows older, you’ll likely start seeing signs that they are developing anxieties (often related to noise), and other age-related issues like cancer, seizures, joint pain, digestive problems, nausea and even tumor growth. While CBD oil isn’t a cure-all for every condition, reputable studies and anecdotal evidence alike show promising results for treating your pet. 2. Is natural cannabis better than “processed” varieties? If you love your dog, you want to give them the best of everything. Some take this to mean that you should provide them with cannabis in its most natural form, but this misconception can harm your dog. To keep your pup safe, never give them any form of cannabis that was designed for humans instead of dogs. All forms of CBD that are meant for dogs are processed to support their unique health needs, so make sure you only invest in canine-friendly brands. 3. Are vets in favor of CBD oil? Not all vets agree with using CBD oil to treat canine health issues. However, most of their concerns stem from folks who choose to give their dog straight cannabis or CBD oil derived from marijuana, which has 20-30% THC content (and can therefore get your dog high). You want CBD oil that’s derived from industrial hemp, so the THC content is less than 0.3% so it’s both LEGAL and SAFE for your dog. 4. Can you combine CBD oil with conventional treatments? It’s common to question whether you can combine CBD oil with more conventional treatment options like prescription medication. However, it’s always wise to get the opinion of your vet if your dog is on a prescription medication before you start. 5. What are the problems with buying CBD oil? According to FDA testing, the concentration of CBD in commercial products can vary considerably, and some contain little, if any, CBD. [xiv] There is evidence of the FDA busting certain companies for invalid claims about their products, so it’s critical to research brands carefully before committing to one. 6. Can you believe what online brands say about CBD? For this reason, you need to do your research before deciding on a brand. Seek out unbiased product reviews and conduct some background history of the company. This will help you come away with the necessary information to fact-check their product claims. Here’s the Full Spectrum CBD Oil for Dogs made from 100% industrial hemp that we recommend. 8. Why should you avoid CBD Oil with THC? Always look for CBD oil made from industrial hemp … NOT marijuana. This is the only way to ensure the THC content (which produces a mental high) is below the legal 0.3%. So minimal it simply cannot get your dog high. THC is bad for dogs and can make them really sick. Plus dogs don’t like the “high” effect of THC. And in the case of extreme overdoses, the condition can potentially put your pet in a coma. Likewise, THC toxicity can sometimes cause problems because of the other ingredients in the product. [xix] There are a few instances where pets have died after ingesting substantial amounts of marijuana, so it’s imperative that you regulate your dog’s dose and keep them away from products that contain THC. 9. Is CBD oil for dogs safe? Unlike most conventional treatment options, medical-grade CBD oil won’t trigger adverse side effects for your pet. Consensus: Is CBD Worthwhile for Your Pet? When it comes to understanding the health effects of CBD oil, we are in a renaissance of medical research. New studies are being published each year about the efficacy of this compound for humans and canines alike. However, we are still at the beginning stages of fully understanding this product’s true potential, which means that many of CBD oil’s purported benefits cannot yet be conclusively proven. If you want to test CBD oil for yourself and see what other pet owners are raving about, investing in a quality product is a critical part of the process. If you’re curious, here’s the Full Spectrum CBD Oil for Dogs made from 100% industrial hemp that we recommend. [i] Livescience: What is THC? [ii] Hempmedspx: Which States is CBD Oil Legal for Purchase? [v] Hempmedspx: Which States is CBD Oil Legal to Purchase? [x] Sol CBD: Are You Using Organic CBD Oil? 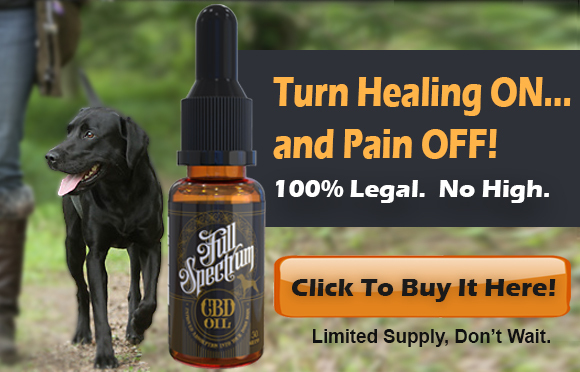 Last PostIs It Legal to Give CBD Oil To Your Dog?